Product description: The piston rod stops in position even when the load on it has been removed. It is returned by supplying air. Enabled for step feed control. Buy Hydro Speed Regulator, Wholesale Hydro Speed Regulator. Air return regulators serve the same function as the spring return type in that they control the forward speed of the drill. However, the air type requires an air signal at the end of each drilling cycle to return the regulator to its original position. Also, these regulators are required for peck feed drilling as they are capable of holding the drilling depth at the end of each peck feed motion. Purros Machinery Hydro speed regulators are designed to control the forward speed (feed rate) of the Electro Pneumatic Drilling Units. Use of a regulator provides adjustable feed rates, faster cycle times, reduces burring, eliminates drill breakage, and prevents sudden forward surges at drill breakthrough. 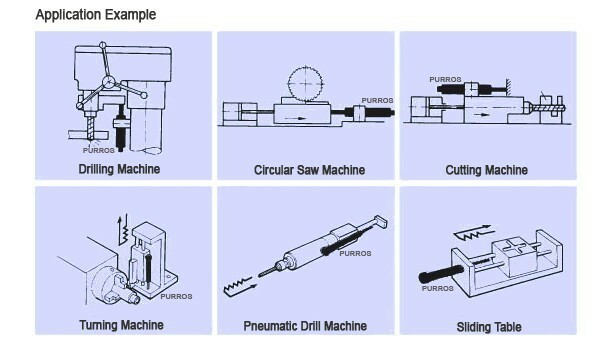 One regulator is required per Electro Pneumatic Drilling Units for drilling operations. Even if remove the load of piston rod of R-A type hydraulic damper, the piston rod still can stay at original position, only provide compressed air piston rod can return, a multiple setp feed control can be carried out. 1. With the position of the piston rod maintained along the strokes as desired efficient pack feed drilling is possible. 2. Longer strokes available for extended application purpose. 3. Easy to install, Leakproof, No need for piping or wiring. 5. Life of Millions of cycles without leaking.